The National Science Foundation has awarded a $1.47 million grant to Emory College biologists Christopher Beck and Nicole Gerardo and Morehouse College professors Larry Blumer and Sinead Younge to expand one of Emory’s signature undergraduate research experiences to colleges across the country. The five-year grant for the Bean Beetle Microbiome Project provides a chance to examine how autonomy in deciding research questions helps students learn, while also generating new data for the biologists to consider in their own research. “We are really trying to bridge the educational aspects and the research aspects of science, with benefits to both,” says Beck, a professor of pedagogy in Emory College’s biology department. 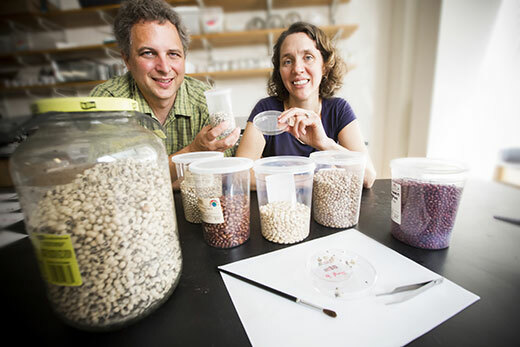 Beck and Blumer have studied bean beetles, a pest insect found in Asia and Africa, for 20 years. They first received NSF funding in 2006 to develop bean beetles as a model system for undergraduate laboratories. To further promote inquiry-based labs, the NSF also supported the pair in developing a beetle handbook and a shareable list of three dozen lab modules developed by college faculty nationwide. “Our goal has always been to make lab protocols that have been class-tested freely available,” Blumer says. Beck developed one of those modules, which has students grow bean beetle larvae on different types of beans — the only food they will ever eat — to see how the diet may affect the beetles' gut microbiome, the bacteria living within their digestive tracts. Since 2015, Emory College students have conducted that research in introductory biology labs. Four years of the new five-year NSF grant will be spent teaching the module’s research protocols to biology faculty from historically black colleges and universities, community colleges, liberal arts institutions and research universities. The faculty will return to their home institutions and implement projects for students to isolate gut bacteria from beetles, then identify the bacterial taxa, using common laboratory techniques such as PCR, sequencing and bioinformatics. Professors will provide guided research, requiring research on a specific question, in some of the labs. In others, students will get to define their own research questions about the microbiome. Beck, Blumer and Gerardo will gather the research data that students collected in their courses each year, creating an ever-expanding repository of data on the bean beetle microbiome. That should provide plenty of new fodder for researchers interested in insect microbiomes, says Gerardo, an associate biology professor who studies how microbial communities shape the ecology, evolution and behavior of their insect hosts. Providing some students a research question while allowing others the freedom to define their own also helps determine that flexibility helps students learn. Simultaneous to collecting educational assessment data on students, Younge will conduct focus groups on the student learning experiences. Together, the information will allow science educators to consider how to best design laboratory courses for student learning. “Overall, this project leverages an animal system that can be easily maintained in undergraduate lab settings, to teach about the process of science, to study how student autonomy changes learning and how to better understand how animals form associations with particular microbial partners,” Gerardo says.